Entry 45 – Coexist? Co-Bleep-Yourself! Given the current rancor in Washington with the partial government shutdown, I thought it might be appropriate to explore another rancorous group, the ‘Anti-CoExisters’. 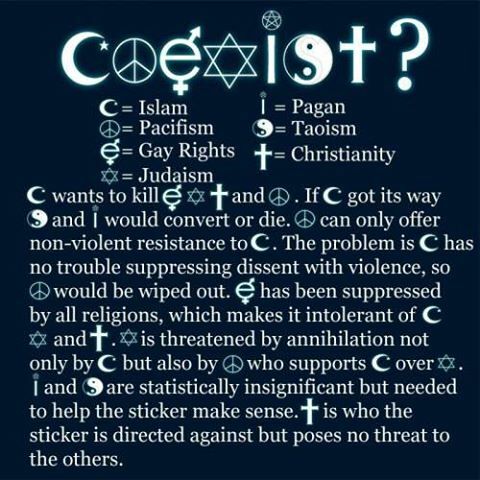 ‘Every time I see a coexist bumper sticker I think of this. A reality check for those fools. Given what we’re bombarded with on the daily newswires, the anti-Islamic statements expressed above are understandable to a certain degree. I say, ‘understandable’, but they are not tolerable. I know that it only takes one terrorist attack in the name of Allah for the above statements to resonate with many, many people. I am NO fan of Islam, and I’m certainly NO fan of religion. What I AM a fan of though is TRYING TO GET ALONG, yes, COEXIST with one another. If we don’t make efforts to coexist on this planet, what will this world look like in another 10, 20, 30 years? I shudder to think about all the violence that could be exacted in our own country of the United States on those who are not of the dominant practicing Christian faith. Broad generalizations about a peoples’ faith are dangerous to make, and those that create these generalizing ‘memes’ are doing so at the world’s peril. If it were up to me, we’d all by Atheists living in a material world working for the betterment of humanity simply because that’s just a better way to live your life… helping others. We’d all join up in our communities and work side by side, with no pretense of a supernatural deity blessing or cursing our efforts, to fix the problems that plague our communities. Islam has its crazies, just like Christianity, just like Judaism, just like any religion where its followers decide that its tenets need to be written down on a piece of paper, and called ‘Holy’. I think Beth, the person that wrote the Facebook post, my friend who shared the post, and whoever the person was that created the little pictorial, are just acting out of fear and ignorance. They obviously have never met the Islamic people I know who are peace loving people, and don’t ascribe to any of the generalizations that the above picture portrays for their faith. And they obviously haven’t gone to Indonesia where over 200 million Muslims practice their faith in relative obscurity and peace each and every day. And they haven’t spent any time in Muslim areas in our own country like in Illinois where nearly 3 million Muslims practice their religion every day without a terrorist attack, or their next closest in population State, Virginia, which has over 2.6 million Muslims practicing the same way. Or New York, New Jersey, Texas, Michigan, Florida, Delaware, and Pennsylvania who, combined, have nearly 10 million Muslims in their States not strapping on suicide vests, or killing Pacifists, Gays, Taoists, Christians, Jews, Pagans, and the like in vengeance. To Beth, and my friend who shared Beth’s post, I’d just like to plead for you both to stop this kind of unproductive hate speech. Please try to rethink your positions on coexisting with other religions on the planet. The alternative, where we refuse to coexist, is a much, MUCH scarier reality. Mostly enjoyed this piece, with the exception of the typo “shutter” when you clearly meant “shudder” (apologies for the minor quibble ;-). However, I do also share a problem with the notion of “Coexist”, but this is due to the colorful threats of eternal damnation, or at the very least outright denial to a pleasant afterlife that is built into each of the Abrahamic brands. The very strict policies about admittance and afterlife perks create exclusive clubs that don’t exactly build a foundation for civil coexistence. So, unlike your friend who appears to be motivated by racism, I would suggest that the notion that peaceful coexistence is possible among true believers is somewhat naive, given recorded history’s damning evidence to the contrary. Thank you, Elise, for your comment. Appreciate you checking out the site. To answer your question, the way I look at the Christianity I was brought up in requires me to think of the process of letting go of this set of teachings as a kind of recovery procedure. If you read my early posts on the website you will start to see what I mean by the word recovery. Happy to keep the conversation going though if you have further questions. Again, many thanks for checking out the website. Greatly appreciated! 🙂 Have a great day!